100% PREMIUM 3-PACK AROMATHERAPY INHALERS: Our Certified Aromatherapists have included a 3-Pack of Aromatherapy Inhalers in our line of products you can benefit from using, that is made with 100% premium products. EASY TO USE: Separate the cap and bottom section from the glass bottle located inside. Unscrew the silver cap from the glass bottle. Place 5-15 drops of essential oil on the provided wick that is conveniently pre-loaded in the bottle. Screw the silver cap onto the bottle and place back inside the tube. Remove the cap from the tube and inhale as needed. REPLACING THE WICK IS A BREEZE: To replace the wick, simply remove the used wick with tweezers and put a new wick into the glass bottle. The glass bottle can be cleaned and wiped out if needed. If using the same essential oil/synergy, continue to use the same wick for 2-3 months and just add a few drops of essential oil when needed to strengthen the scent. LIGHTWEIGHT AND PORTABLE: Our Aromatherapy Inhalers are lightweight and portable making them easy to travel with. Keep your beloved essential oils with you everywhere you go! HAVE QUESTIONS? : We are happy to help you with your 3-Pack Aromatherapy Inhaler questions. We welcome your questions and input! PREMIUM 3-PACK ALUMINUM INHALERS Plant Therapy is renowned in the aromatherapy industry for our strict standards of quality and use of the finest sources and processes. These standards are evident in the creation of our top-quality 3-Pack Aluminum Inhalers. EASY TO USE Separate the aluminum cap and bottom section from the glass bottle located inside. Unscrew the silver cap from the glass bottle. Place 5-15 drops of essential oil on the provided wick that is in the bottle. Screw the silver cap onto the bottle and place back inside the aluminum tube. Remove the cap from the aluminum tube and inhale as needed. 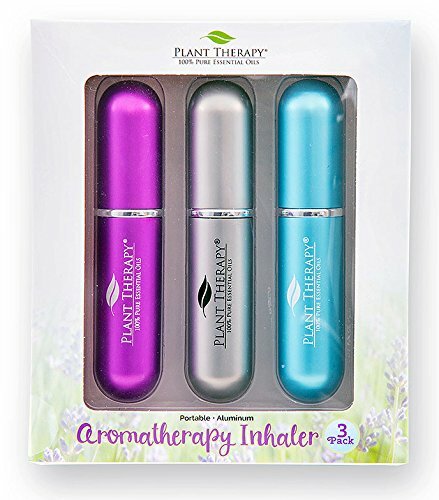 LIGHTWEIGHT, STYLISH DESIGN Lightweight and stylish, the 3-Pack Aluminum Inhalers come in three different colors with a modern Plant Therapy logo. The three colors that they come in are teal, purple, and grey. It is a great gift for any essential oil user.